Newer vehicles with the 9-pin connectors often still have older J1708 data on them. This adaper allows an older style 6-pin device to connect to a newer 9-pin connector. 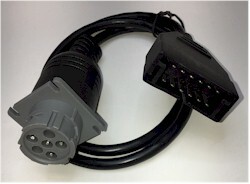 Use this adapter to connect a 9-pin tester capable of using J1708 to a vehicle with a 6-pin connector. 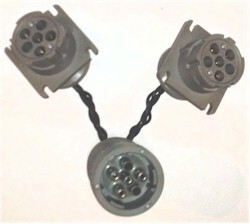 Some J1708 vehicles use the older style GM ALDL connector. This adapter converts the ALDL J1708 connection to a standard J1708 6-pin connector.